After receiving interest from potential bidders, it seems Eve Online developers CCP are considering putting the company up for sale. At least, they’re said to be “exploring strategic options including a sale of the business”. For more like Eve, check the PCGN list of the best space games. This report comes via Bloomberg, citing “people with knowledge of the matter”. We’ve since contacted a PR representative for CCP and got a “no comment” in reply. CCP could be valued as high as$955 million, say Bloomberg. If a sale did go ahead, no doubt the new owners would want to continue pushing Eve, since that’s CCP’s bread and butter, but whether they’d change anything about the space MMO or not is another matter entirely. Eve is known for being a game where the developers remain hands-off, letting the community create emergent stories born of conflicts and double crosses. Let’s hope that, if a sale does happen, the new owners will understand the MMO’s appeal. 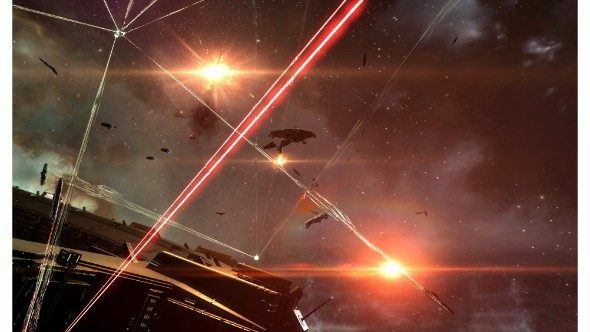 Since Eve recently went free-to-play, you might want to check out our beginner’s guide.